Million Dollar Worth CAR GRAVEYARD! - Muscle Cars Zone! Million Dollar Worth CAR GRAVEYARD! We have seen some real cool car collections over the years. Amazing vintage rides, some abandoned vehicles as well as plentiful of barn finds! However, this car graveyard is somehow different as deserves attention. 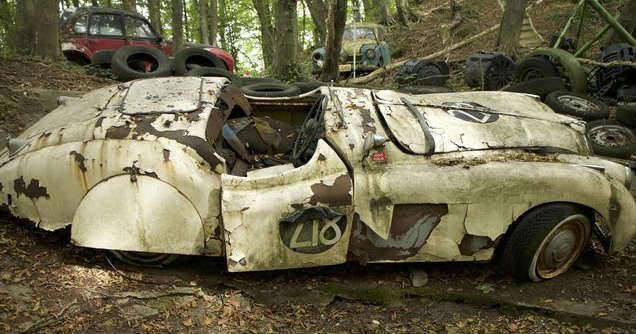 Allegedly, former racing driver Michael Frochlich, had deliberately crashed these cars and left them abandoned in a German forest. His father had told him to do something with his life by the time he turns 50 years. The driver had however won the Grand Prix race of Germany driving his own vehicle – Jaguar XK120 – classic! After that, he collected one vintage car for every year, from 1984 to 2000. It remains unknown why the driver decided to burry and crash his cars, but the numbers are mind blowing. The car graveyard includes his very own aforementioned Jaguar which is worth $170,000. It is followed by a Porsche 356 racer as well as a Buick, both worth $17,000. However, the highlights go to his Rolls Royce which has a doll of Queen Elizabeth at the wheel, as long as we are concerned! It seems necessary that you go below the text and watch the video of this million-dollar worth car graveyard. Before you go, click here to visit another barn full of old GM cars.